What does a typical day in Shockley’s schedule look like? It's filled with writing jokes, pitching jokes, falling in love with jokes, then having to throw out those jokes and come up with new jokes to fall in with love all over again. I try to get an hour of work done before my one-year-old daughter, Lucy, wakes up. This morning, I watch the new cut of my latest episode because it’s still 30 seconds too long. And in a 22-minute show, 30 seconds is a lot! As I watch the cut, I draft up a list of lines and scenes that I feel could be cut. 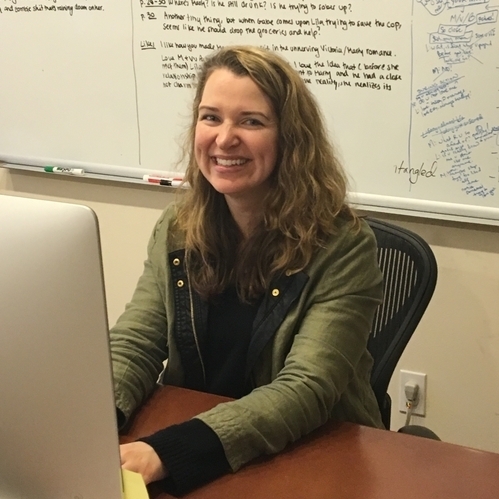 Then I send my suggestions to the Executive Producers and Showrunners, Kenya Barris and Jonathan Groff, who will use my notes to make final decisions with the editor. It’s sad to see funny moments go, but if they don’t move the story forward, they’re on the chopping block! Lucy is up! And she’d really like to start playing right now. Like right now would be great. Did she mention right now would be good? Anytime. Or right now. Heading out the door, I grab a pile of post-it notes I scribbled on last night. I tend to have a lot of ideas right before I fall asleep so I illegibly write things down in the dark and try to decipher my hieroglyphics the next morning. Last night’s thoughts are about the pilot I’m doing with Showtime. It’s a comedy about dealing with your difficult family during a zombie apocalypse. I think I found a better blow for a scene, which is exciting because the “blow” is the last joke that gets you out of a scene, so there’s a lot of pressure on it to be really strong. No wonder I couldn’t sleep. The first thing I do when I get into the Black-ish office is read the notes on the story we’re working on. Or, if we’re in the middle of a rewrite on a script, I’ll read “the Progress Draft,” which is what we were working on the night before. These notes and drafts are compiled by our amazing writer’s assistants so we can pick up the conversation each day exactly where we left off. The Writers’ Room Starts. I’m typically in the writer’s room 8 to 12 hours a day. There are 13 other writers on staff and we sit around a large conference table working out every new story idea and rewriting drafts so everything’s as strong as possible before it’s shot. We use corkboards and note cards to track the big ideas we want to hit during the season and we use white boards to 'break' each episode (meaning figuring out the shape of a story scene by scene). Once the story is ‘broken’ and ready to be outlined, a writer is assigned that episode. When you’re assigned an episode you’re responsible to shepherd that episode through the entire process – you guide it through many rewrites, you supervise production and work along side the director the week it’s being shot, and you give notes once it’s in post. Today, Kenya leads the discussion on possible areas for the next episode. We are always looking for a fresh observation, a new way to tell a story. On day one of Season One, Kenya said to the writers, “I want this show to be about all the things we’ve maybe thought, or noticed, or talked about in the privacy of our homes or marriages, but have been too afraid to say out loud. Let’s start a conversation. Let’s not shy away from what’s real.” As a result, every single episode has started from something that’s happened in one of our real lives. We have a really diverse staff not only in terms of having equal number of Black and white writers, and male and female writers, but we’re also very diverse in terms of our political and cultural views. We spend a lot of time debating current events, hot-button issues, and personal problems we’re faced with right now. Like, how do you parent in the Internet age? How do you believe in our justice system when it fails us so frequently? And how did the phrase ‘on fleek’ go from being cool to being lame so quickly? It’s lunchtime. We dive headfirst into our sandwiches while we watch a cut of an episode that’s picture locking tonight. These lunchtime screenings serve as the episode’s first audience experience. We give our notes and then we quickly cast the roles for our upcoming table read because writers have to read the parts of the actors who haven’t been cast yet. Table read! This is the highlight of our week. It’s both exciting and nerve-wracking. It’s where jokes live or die. Our cast is amazing at table reads -- it’s like watching a full-on stage play. And this is where we get to hear the words out loud for the first time, and get a feel for what’s working and what’s missing the mark. The network and studio are there, too, and they give us their notes, which is usually the nerve-wracking part. The punch up begins -- my favorite part of my job! We’re back in the writer’s room to start the rewrite of the script we just table read. We talk through how to address the studio/ network notes and then we spend a lot of time punching up jokes before it shoots Monday. I love punch up so much because I come from an improv background so my mind is always thinking of ways to heighten the scene's "game" or comedic premise so we're reaching its maximum potential. I switch gears to take a notes call with ABC Studios and my pod about my pilot. (Pods are production companies with a studio deal to find new projects and guide them through the development process.) Today, I’m getting notes on the Studio 2nd Revised Draft we’re getting ready to send to Showtime, which is what they’ll read to decide if they want to shoot my pilot or not. Yet another exciting-slash-terrifying moment in my day. Sometime between 6:00pm and 9:00pm The writers’ room wraps for the day, the writer’s assistants compile all the notes, and we’ll pick back up where we left off tomorrow. Since it’s Wednesday night, I come home and get to watch Black-ish with my husband. He’s a drama writer, currently on the Art of More for Crackle, so it’s always fun to see what makes him laugh. Nothing feels better than when he really cracks up. The Next Day. 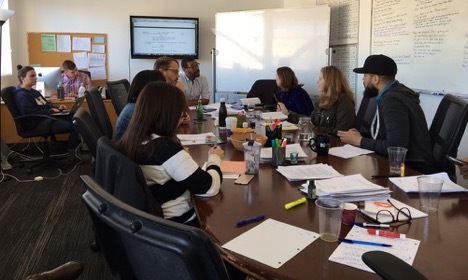 The writer’s room looks at last night’s ratings. We look at how our numbers are compared to our lead-in and if the fact that Modern Family was a rerun affected us. Then we remind ourselves it’s the Live + 3 number that really counts (Live + 3 is the live viewing plus DVR up to 3 days later and Blackish is sometimes the most DVR’d comedy of the week! So cool!). Then we go online to read the reviews, but we try not to take any negative reviews to heart (try, being the key word here). Mostly, because we don’t have time – we have to dig into breaking the next episode! Black-ish was recently nominated for three Emmys -- Best Comedy Series, and Best Actor and Actress in a Comedy for Anthony Anderson and Tracee Ellis Ross. 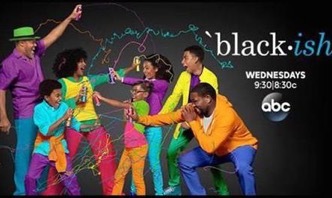 You can root for Lindsey and the rest of the "Black-ish" team on Sunday, Sept. 18th on ABC.